and I will especially grateful. Christmas gifts for my special friends and family. Royal Albert 'Old Country Roses' is a timeless china pattern. I must admit I was blessed to find the dishes in this post. I had one cup I found at the thrift store a few years ago. Saturday morning I found these dishes and the candle holder. I bought all the dishes for $5.00. Yes! I am so in love with this dish pattern. Old Country Roses' signature motif of burgundy, pink and yellow roses, accented with lustrous gold banding. scent of the roses in the house is incredible. wish you a safe and Happy Thanksgiving holiday. Your tea setting is just beautiful, Betty! 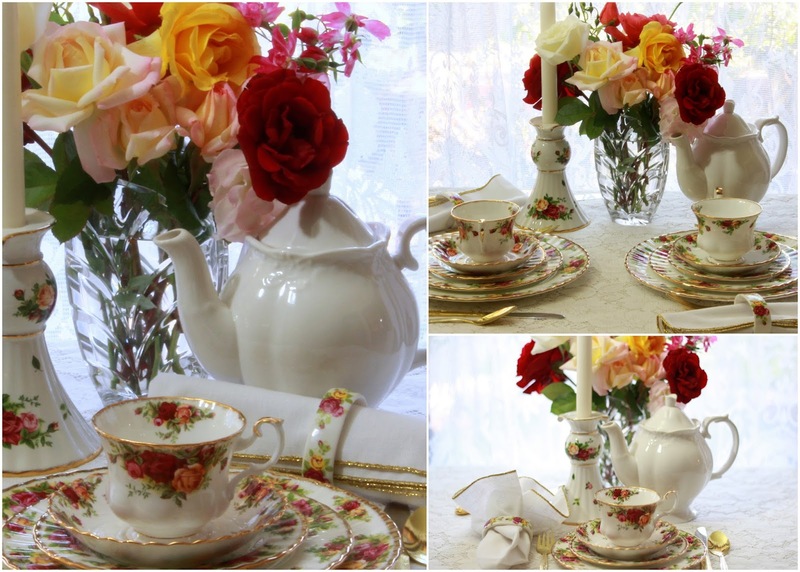 I love the OCR pattern and I have several pieces including the teapot which was a birthday gift from my family a few years ago. Your roses look lovely with your setting. I'm sure your calendar is lovely too. Have a wonderful weekend and Happy Thanksgiving this coming week! This is simply gorgeous and elegant ! The OCR pattern is stunning, one of my favs Betty; you're so lucky to own such pieces. Pretty roses to go with it all as well. I can't believe your beautiful finds. Royal Albert is indeed a premier china. Lovely! Happy Thanksgiving. Betty, this was soooo beautiful! Love your roses with the Old Country Roses. It all looks so warm and inviting! Yes, we do have so much to be thankful for. I love your pretty photos and lovely posting here. Thanks for sharing as we all love love Old Country Roses!!! OCR is one of my favourite designs too! The $5 dishes are an awesome deal. Happy Thanksgiving, Betty! Did you know that Old Country Roses is the most famous all time pattern. Lovely!